COMSTOCK PARK, MI - Sloppy fielding spelled disaster for the West Michigan Whitecaps as they fell to the Bowling Green Hot Rods 6-5 in game 1 of the Midwest League Eastern Division Semifinals Saturday night at Fifth Third Ballpark. 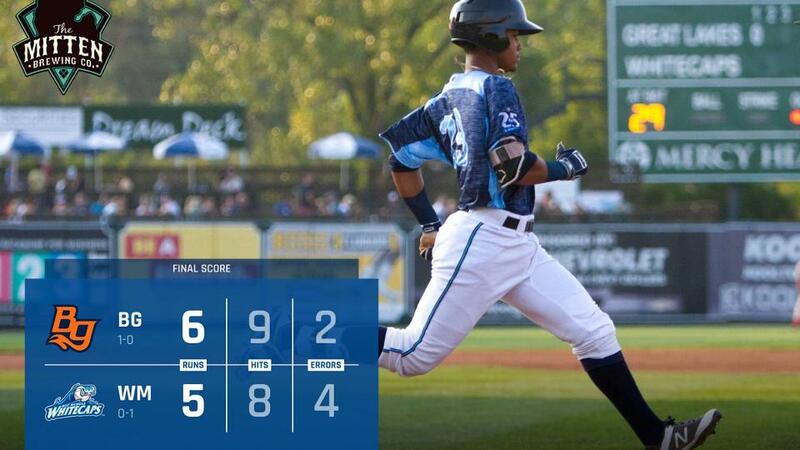 Whitecaps outfielders committed four errors -- three by left fielder Rey Rivera -- allowing two critical unearned runs to cross in the 6-5 defeat. Bowling Green struck first in the third as Jim Haley lined a two-run triple to put the Hot Rods out in front 3-0. Zach Rutherford pounded a double to left field which combined with a Rivera error allowed Trey Hair to scamper home from third and extend the Hot Rods lead to 4-0. The 'Caps plated two in the sixth on a Brady Policelli two-run home run slimming the lead to 4-2. The Hot Rods added two more runs in the top of the seventh before the Whitecaps countered with two runs in the bottom half bringing the lead to 6-4. In the ninth, Reece Hampton lined an RBI-double to right field trimming the Bowling Green lead to 6-5. The Hot Rods opted to intentionally walk Wenceel Perez to load the bases before Colby Bortles popped out to first, ending the 'Caps two-out rally as they suffered their first loss of the 2018 postseason. Whitecaps starting pitcher Chance Kirby (0-1) tossed five innings allowing four runs on seven hits while striking out six in his first loss of the postseason. Bowling Green starting pitcher Resly Linares (1-0) pitched 5.2 innings allowing two runs on four hits while striking out five in his first postseason victory. Tyler Zombro came on to relieve Linares in the fifth, throwing 1.1 innings while allowing two runs on three hits before Matt Seelinger closed the game going two innings allowing a run on one hit to collect his first postseason save. Reece Hampton and Brady Policelli had big nights at the plate; both went 1-for-4 with a pair of RBIs. Rivera also reached base three times in a losing cause. The Whitecaps need to win their next two games in Bowling Green to advance to their first Midwest League Championship since 2015. The Whitecaps hit the road for Games 2 and 3 (if necessary) of the 2018 Midwest League Eastern Division Finals against the Bowling Green Hot Rods beginning Sunday night at 7:35 pm from Bowling Green Ballpark. Pitcher Elvin Rodriguez gets the start for West Michigan while righty Paul Campbell gets the call for Bowling Green. Broadcast coverage with Dan Hasty begins on the Whitecaps Baseball Network at 7:25 pm. Tickets are available for any Whitecaps 2018 home contest by calling the Whitecaps front office at 616-784-4131 or by visiting www.whitecapsbaseball.com.